Early morning sunrise at Cain Vineyards on Spring Mountain in Napa. Gamble Family Vineyards and a glass of rose. Believe it or not, wine is made in all 50 states in the US--- and California produces more wine that any other. While there are dozens of great wine regions in the Golden State to visit, none are as iconic as the Napa Valley. Napa Valley was declared California’s first American Viticultural Area (AVA) in 1981, and how far we have come: today there are approximately 475 physical wineries producing around 9 million cases of Napa Valley wine each year under more than 1,000 individual wine labels! SO obviously the main attraction is wine tasting--- although dining, spas, golf, and other leisurely pursuits like hot air balloon rides are also worth checking out. If you ever wanted to experience your most luxurious-but-still-rustic 'Best Life', Napa Valley is the place to do it. Just about a 90-minute drive north of San Francisco, Napa Valley Wine Country is an easy day/weekend trip if you're visiting the Bay Area. 30 miles long and just 5 miles across at its widest point, the Valley encompasses 6 towns, each with its own distinct vibe: American Canyon, Napa (downtown has dozens of wine bars and tasting rooms, the Uptown Theatre, and Oxbow Market), Yountville (home of famed restaurant The French Laundry and my favorite sandwich spot on the planet, Yountville Deli), Oakville, Rutherford, St. Helena (adorable small town that's fun to stroll and shop), and Calistoga (big time spa territory with its natural mineral pools and mud baths). Route 29 runs right up through the valley and many of the wineries are located straight off the highway, making getting around very easy--- just don't forget to designate a driver if you're planning a long day of tasting! There are plenty of lodging options in Napa Valley- hotels, Inns and B&Bs, vacation rentals- but my favorite for a relaxing retreat is The Meadowood in St. Helena. The gorgeous property is situated on a 250 acre private estate, and every suite has its own private bungalow vibe with a sitting room complete with fireplace, and a private deck to enjoy a glass of wine and peaceful moments between winery visits. The Meadowood also has a full-on croquet court! With an al fresco bar! (NOTE: you must be wearing all-white attire to go on the croquet lawn, a fact nobody told me about so I didn't pack properly, therefore missing out on a croquet-and-Chardonnay moment. Yes, my heart is still broken). There are also tennis courts, a golf course, a lovely pool and an acclaimed 3-star Michelin restaurant with an incredible wine list. Don't forget to visit the bar with a brilliant cocktail program by Sam Levy, perfect for a nightcap after a long tasting day. The staff and service at the resort are A++. I'm sure many of you have your favorite Napa wines--- and I encourage you to go see where they're made! I do advise that you research before your trip to see if their tasting rooms are open to the public, or if they require an appointment. Many will require you to call first and set up a reservation, or to have a referral from a Wine Club member- your hotel concierge might also be able to help. And be aware: it's VERY tempting when you are enjoying the idyllic Northern California views and sipping on delicious wines to let yourself be persuaded to join the wine club- where you will receive private shipments throughout the year.... so have your credit card ready (or locked in your hotel safe, depending on your intentions and/or willpower). 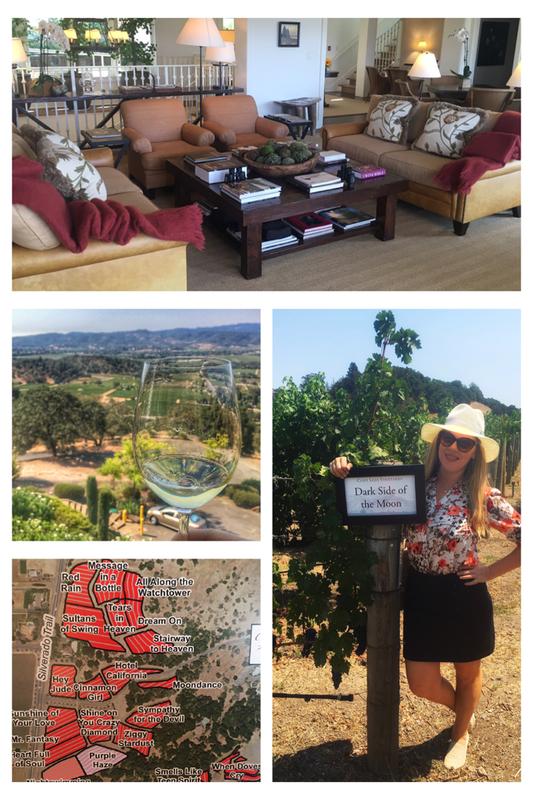 I'm excited to share with you some of my experiences from my most recent Napa Visit! Cain Vineyard & Winery is cradled in a spectacular bowl overlooking the Napa Valley from the crest of the Spring Mountain District. Varying in elevation from 1,400 to 2,100 feet (450–675 meters), Cain Vineyard is spectacularly situated along the crest of the Mayacamas mountains. The estate vineyard is planted to the classic set of five 'Bordeaux Varieties': Cabernet Sauvignon, Cabernet Franc, Merlot, Malbec, and Petit Verdot. Their 3 flagship wines are Cabernet Blends and are full-on fabulous: Cain Cuvée— a blend of two vintages and a selection of vineyards, Cain Concept—representing the classic benchlands of the Napa Valley, and Cain Five— the product of the incomparable Cain Vineyard. The Cain Five is a true cult wine... if you ever get an opportunity to get your hands on a bottle, don't think twice--- just do it! Side note: can you believe my iPhone took this??? Next stop was a glass of Sauvignon Blanc on the terrace of the lovely Poetry Inn! Designed by world-renowned architect Howard Backen, the Inn is perched on a hillside overlooking the entire Valley floor (amazing views!) and is run like an elegant private villa. There are poetic touches throughout the house and this would be, in my mind, an ideal honeymoon destination. How sweet is the drawing room, pictured below? Then it was off to explore the adjacent Cliff Lede Vineyards (pronounced like 'Cliff Lady'). A vineyard walk is so fun there because the entire property is rock 'n roll themed and the vineyard blocks are all named after famous rock songs ('Message In a Bottle', 'Stairway To Heaven', 'Dream On', etc). Every year their 'Rock Block' Cuvee is a blend of 2 of the vineyards--- this year it's 'Stardust Heaven'. Cliff Lede is a great place to spend an afternoon; their tasting room has a lounge called 'Backstage' that features rotating exhibits of rock-themed art and photography. Check out the map of one of the Cliff Lede vineyards.... 'Smells Like Teen Spirit' wine, anyone??? Located in Calistoga, Frank Family Vineyards is an historic vineyard site from the 1800s, reborn in 1992 as an excellent source of quality Cabernet, Chardonnay, Zinfandel, and a collection of traditional-method sparkling wine too! You have to make a reservation for the tasting room, but the wines from winemaker Todd Graff are truly excellent and worth a drive up to Larkmead Lane. When in Napa..... bring out your tiger-print jumpsuit? Why not! Ehlers Estate is a beautiful property in St. Helena planted to Cabernet Sauvignon, Merlot, Cabernet Franc, Petit Verdot and Sauvignon Blanc. I had the good luck of visiting on the very first day of harvest- I couldn't resist the temptation to get a photo opp with a batch of freshly picked Sauv Blanc grapes! The estate is 100% Certified Organic, and they incorporate plenty of Biodynamic principles into their winemaking as well. Winemaker Kevin Morrissey believes in a holistic approach to the land and the vines that cover it, which I always appreciate. Ehlers' tasting room is known for their exceptionally warm hospitality, where every group has their own host (ask for Bradley!). One tasting I recommend as a true CANNOT MISS experience in Napa is a visit for their signature “Start Your Day” breakfast tasting! Yes, you read that right. It starts bright and early at 9am sharp (reservations required), and the wines are accompanied by a basket of fresh Bouchon Bakery croissants! It's an unexpectedly decadent way to 'rise and wine'. Croissants + Cab? Yes Please! After all that wine tasting, you may be hankering for a cocktail.... I know I was! As you can imagine, wine really does run the scene in Napa, but they are kicking out some serious craft cocktails at Goose and Gander in St. Helena. The food menu is seasonal small plates, and is quite tasty (it's hard to find a bad meal in Napa Valley), but I was blown away by the creativity of the drinks. Dine on the patio, but be sure to visit the basement bar for a boozy creation. Here's to living the lush life in Napa!